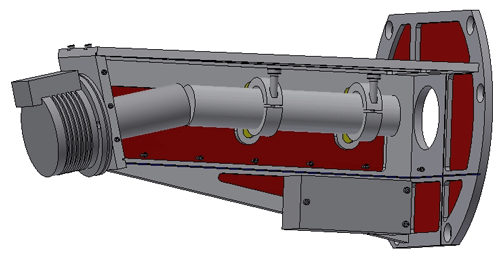 CAD drawing of LOTUS, deployed on the Liverpool Telescope in July 2015. LOTUS was decommissioned in mid January 2019. The information presented here is for historical purposes only. LOTUS (LOw-cosT Ultraviolet Spectrograph) is a low resolution optical-near UV spectrograph. The design is very simple, with no moving parts. It provides wavelength coverage from 3200 to 6300 Angstroms at a dispersion of 4.7 Angstroms/pixel. The slit has "narrow" (2.5 arcsec x 95 arcsec) and "wide" (5 arcsec x 25 arcsec) regions to allow optimal spectral resolution or flux calibration. There are no arc lamps for wavelength calibration. A default wavelength calibration based on arc and twilight sky data taken during commissioning is applied to all data and is thought to be good to better than 10 Angstroms. If a better calibration is required, observers will need to specify observations of a source on-sky which contains emission or absorption lines of a known wavelength, and derive their own calibration. An object of magnitude V=17 will give 1 photon per second per pixel at the peak of the spectrograph sensitivity at around 4100 Angstroms. Users should be aware of the high readout noise however, which will dominate noise statistics until quite high numbers of photons (greater than 1000) are reached. Detector saturation occurs around 30,000 photons. There are a significant number of hot pixels on the CCD which saturate in exposures longer than 300 seconds. To allow their accurate subtraction by library dark frames, observations longer than 300 seconds should be split into multiple exposures. 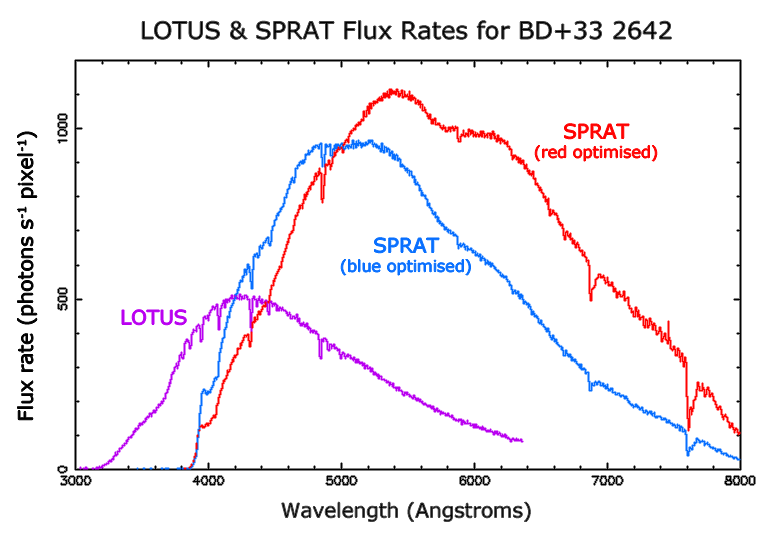 In general, unless you are interested in wavelengths below 4100 Angstroms, SPRAT will always be a better choice than LOTUS. 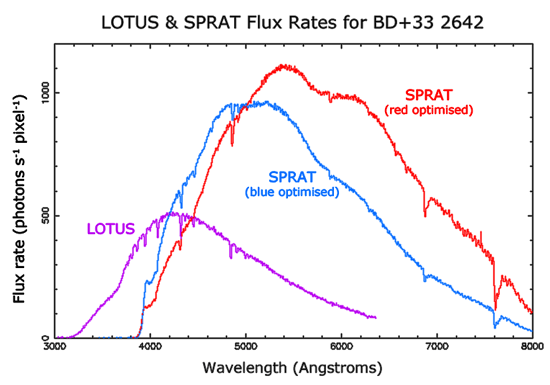 The plot below shows the relative flux rates in photons per second per 4.7 Angstrom pixel from LOTUS (in purple) and the blue and red optimized modes of SPRAT for the spectrophotometric standard star BD+33 2642. Acquisition onto the spectrograph slit uses the same method as FRODOSpec, where images of the field taken with IO:O are used to offset the telescope pointing to a "magic pixel" which corresponds to the LOTUS slit. More details can be found at the FRODOSpec acquisition section . The acquisition overhead for LOTUS (slewing plus moving the target onto the slit) is 4 minutes. The readout overhead is 10 seconds. In order to align the slit vertically (so that the effects of differential atmospheric refraction are reduced) the telescope mount angle must be set to 11 degrees (as per SPRAT).